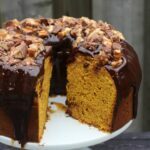 Pumpkin Spice Cake with Chocolate Snickers Ganache - Frugal Mom Eh! 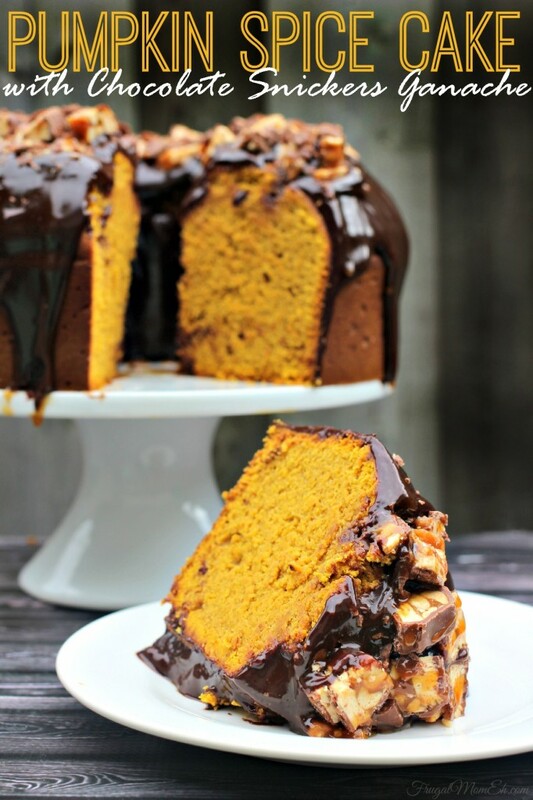 This Pumpkin Spice Cake with Chocolate Snickers Ganache is a decadent Fall Dessert that will have everyone asking you for the recipe! ….and we have more pumpkins! 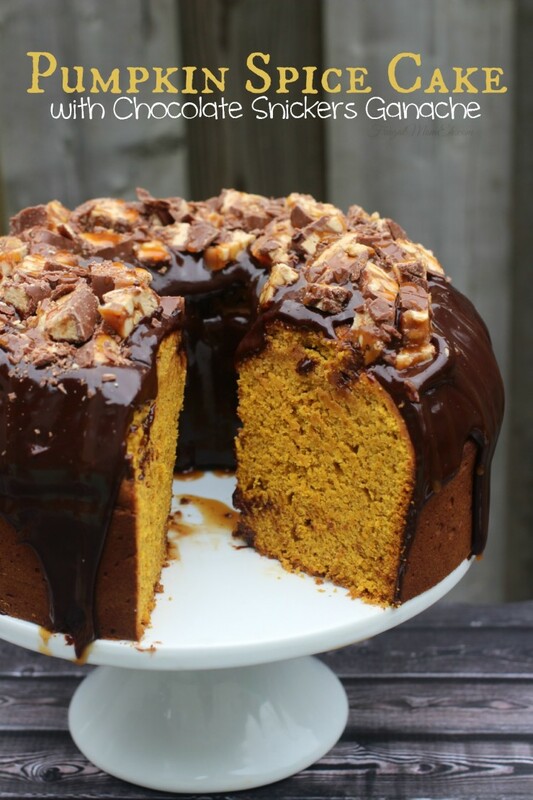 I wasn’t making it up when I said that I went a little over-board with pumpkin this season and this Pumpkin Spice Cake is simply over-the-top amazing. 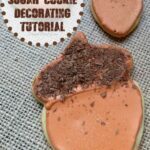 This is perfect for after Halloween too, you can cut up left-over candy bars to crumble over the chocolate ganache. 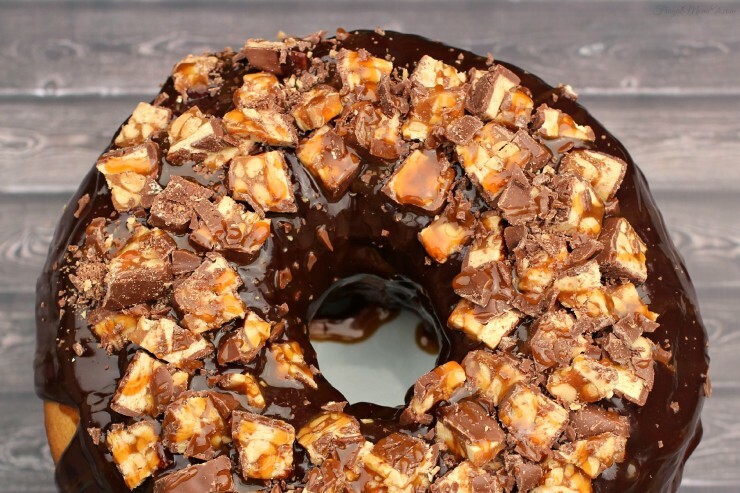 The cake is spiced and not too sweet which pairs nicely with the semi-sweet chocolate glaze but the sweetness comes in with the snickers and caramel drizzle. 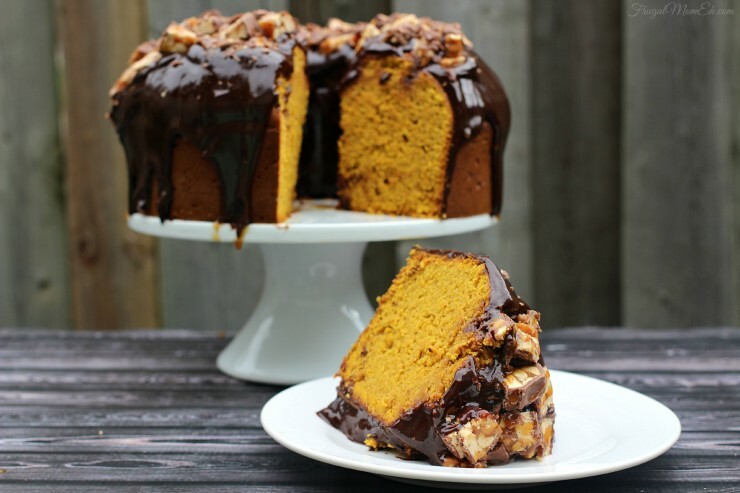 It’s pretty perfectly balanced as far as texture and flavour goes, I can’t imagine a more perfect pumpkin cake. In a large bowl, cream, together butter with sugar. Beat in eggs, 1 at a time, mixing well after each addition then mix in vanilla. 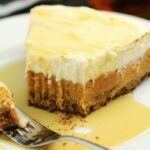 Alternatively stir flour mixture and pumpkin puree into your wet mixture, making 3 additions of flour mixture and 2 of pumpkin puree. Pour batter into lightly greased tube pan with removable bottom or bundt pan and bake in centre of oven for 1 hr. Let the cake cool in the pan for 15 minutes. Holding onto the centre tube, lift cake from pan and cool completely before removing the centre tube. In a small saucepan, bring heavy cream to a simmer, stirring occasionally. As soon as the cream simmers, remove from heat and poor over chocolate and stir gently to make sure all the chocolate is covered. Let the bowl sit for 5 minutes then whisk starting in the centre and work outward until smooth. Let it sit at room temperature for about 15 minutes before pouring it over your cake. Arrange chopped snickers pieces over the top of the cake and drizzle caramel sauce over that. 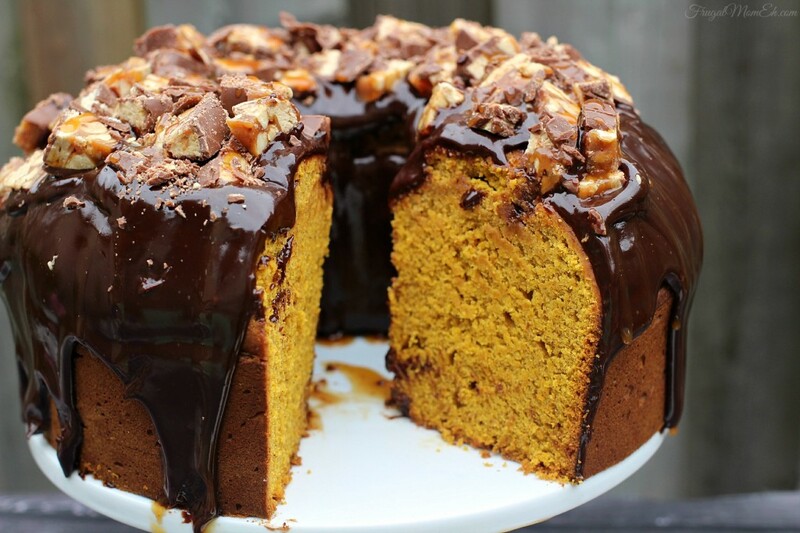 Love Pumpkin as much as I do? 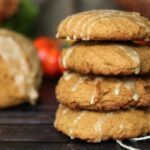 Check out some of my other awesome Pumpkin Inspired recipes! 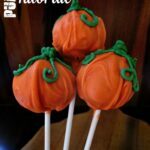 I am going to have to start closing my eyes when I visit your blog, this looks like another amazing recipe and you can’t go wrong with pumpkin and chocolate…now to resist the temptation to go bake it!!!! Oh goodness, that is one beautiful, decadent cake! I need this in my life immediately. 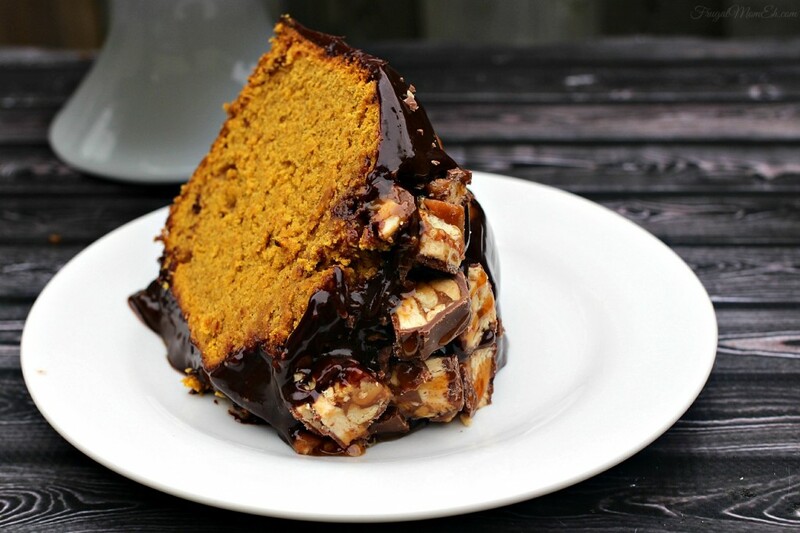 This pumpkin spice cake with ganacche looks and, I am quite sure, tastes delicious. This is a dessert for a special occasion. Thank you for this recipe. Oh wow. Looks soo rich! My little guy has a peanut allergy so would use Mars bars or the same yummy cake! 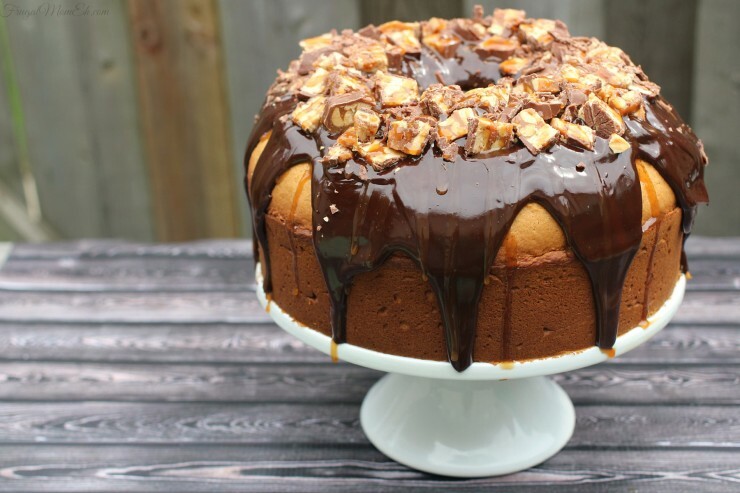 Oh my goodness, this looks decadent!